Becker: Welcome once again to the Torment Interviews. With us this week is Vhailor, say ‘hi’ to the folks Vhailor! Becker: So tell us how you got your start. Vhailor: Well, actually I started out in TV. I was in a few episodes of "Scooby-Doo" playing the role of a ghost. I got to chase Shaggy with an axe. Becker: Yeah, I think I remember seeing those episodes. You were great. Vhailor: Thanks. From there I signed on with Interplay and was in the original Battle Chess where I was one of the knights. Becker: Wow. You really go a long way back with Interplay. Do you still keep touch with your old Battle Chess friends? Vhailor: Oh yes! We just had a big reunion when we were all called on for a cameo performance in Tales of the Sword Coast. Becker: In Durlag’s Tower! You guys were fantastic. I suppose with all your experience you were a shoe-in for Torment. Vhailor: Actually, no. They were seriously considering a bulletproof vest for a very long time, but he got a part in some police movie and canceled at the last minute. Then Black Isle wanted to hire a pair of combat boots, but Interplay put in a good word for me. Becker: What else did you do for Interplay? 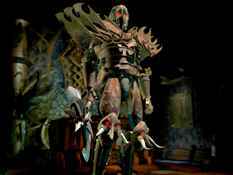 Vhailor: Well, my main role in Baldur’s Gate was Saverok. They had to hire another guy to do the close-ups, but I did the actual moving around. Becker: That looked like a very demanding part. Vhailor: Oh it was! Especially when they asked me die in the end; I was leery at first, but it’s dramatic challenges like that which drove me to become an actor. Becker: So how does working on Torment compare to Bauldur’s Gate? Vhailor: I enjoy the moral center I get to bring to the story. My character has strong values, which I hope will serve as a role model for today’s youth. All I really got to do in Bauldur’s Gate was attempt to drown the continent in rivers of blood, which I don’t feel sends a positive message to youngsters. Becker: ‘The Nameless One’. We’re not allowed to use his real name yet. Vhailor: Right, sorry. If I don’t like what The Nameless One is doing, I can turn on him. Becker: I though he was supposed to be immortal. Doesn’t that make fighting him rather dangerous? Vhailor: Oh, well I have a stuntman do all the combat shots for me. Becker: I didn’t know that. Who is he? Becker: I thought he was on Interplay’s marketing staff. Vhailor: Well, I don’t want to say anything negative about the man. He’s a really great guy, and he takes a lot of hits for me, literally! But let’s just say that Greg likes to tell stories sometimes. Becker: I see. So what do you do when you’re not on the set of Torment? Vhailor: Oh, I like to spend time with my girlfriend. We went to a Billy Idol concert just the other weekend. Vhailor: Oh it was great, I especially liked that one song...I can’t seem to remember the name of it though. Becker: "Eyes Without a Face"? Vhailor: That’s it! How did you know? Becker: Lucky guess. Well, that wraps it up for this week. Remember to keep it here for another Torment Interview!